Trump called for unity despite past weeks of gridlock. 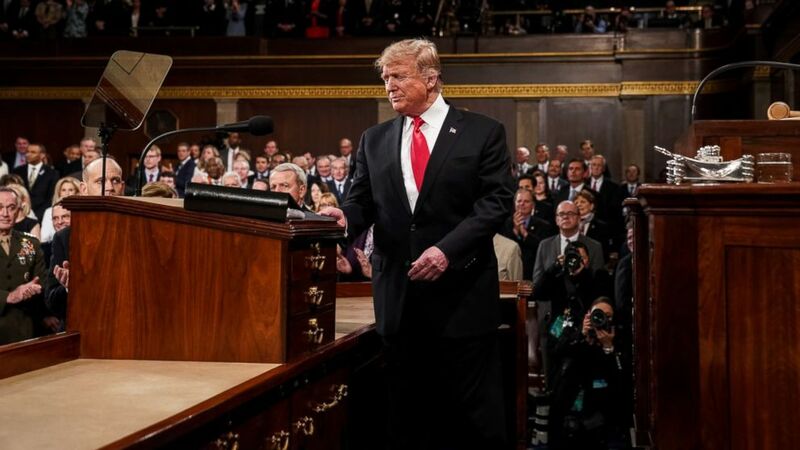 President Donald Trump called for unity again and again in his State of the Union address, delivering a speech that was a sharp contrast to the last month of digging in his heels during a 35-day government shutdown and almost two years of political battles during his administration. Here are five major takeaways from the speech. Facing a newly divided Congress in his State of the Union address, Trump made a call for cooperation and unity to the nation's lawmakers, though persisted in his own uncompromising call for a barrier along the southern border wall. “Victory is not winning for our party. Victory is winning for our country,” Trump declared at the beginning of his speech. “Tonight, I ask you to choose greatness,” Trump said. In contrast with his own words of unity, the president passed up the opportunity to directly congratulate House Speaker Nancy Pelosi on winning the gavel before the joint session and has not, in the days leading up to the speech, let up in his own attacks of Democrats. It was not a topic left untouched by Stacey Abrams, former candidate for governor of Georgia who delivered the Democratic response. “The shutdown was a stunt engineered by the president of the United States, one that defied every tenet of fairness and abandoned not just our people, but our values,” Abrams said in her televised response. As expected, the president stopped short of declaring a national emergency to obtain funds to build a wall on the U.S.-Mexico border without congressional approval. He also did not directly threaten another government shutdown, though he called on both Republicans and Democrats to “join forces” and pass a bill in the next 10 days. His tone reflected the realities of the showdown, which left more Americans blaming Trump and the Republicans in Congress than House Speaker Nancy Pelosi and the Democrats, 53 percent to 34 percent, according to recent ABC News/Washington Post polling. But he didn’t leave out the wall. "In the past, most of the people in this room voted for a wall, but the proper wall never got built. I will get it built," he said with resolve and to applause from Republicans. 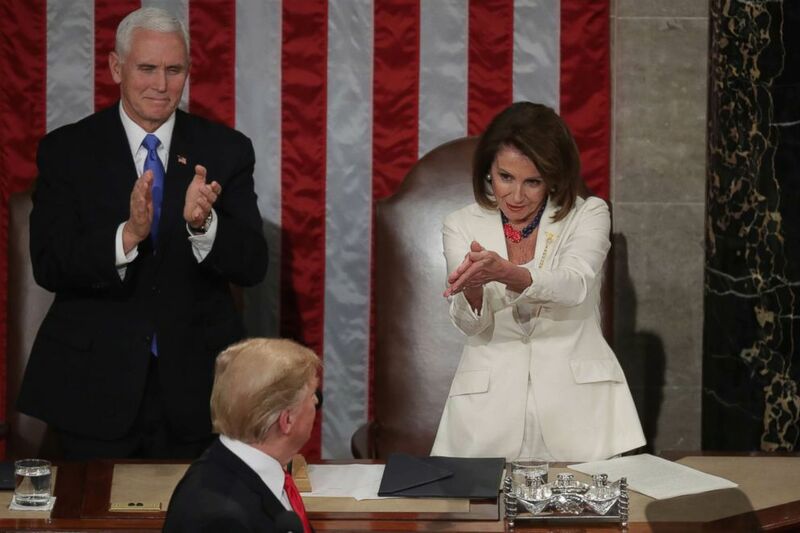 (Chip Somodevilla/Getty Images) Speaker Nancy Pelosi and Vice President Mike Pence applaud President Donald Trump at the State of the Union address at the U.S. Capitol on Feb. 5, 2019. The presence of the largest-ever class of women in Congress was made all the more clear at this year’s State of the Union when they brought about a rare moment: Trump and Pelosi smiling, for the same reason, at the same time. 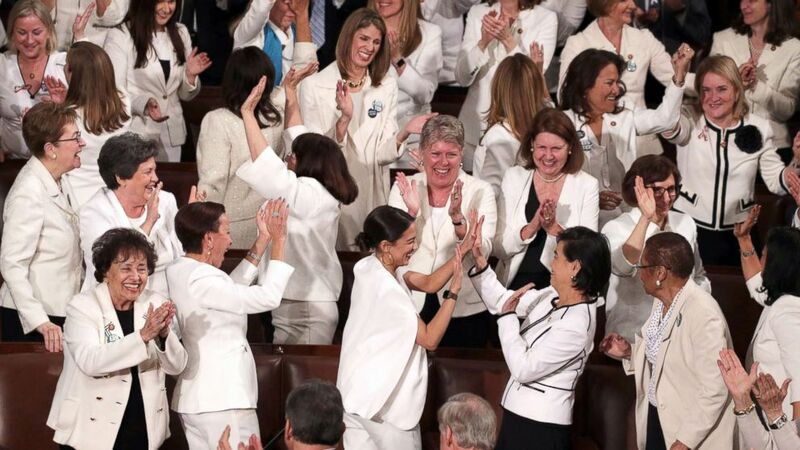 The women, dressed in white to honor the 100th anniversary of the amendment which granted women the right to vote, abruptly stood for the first time when the president spoke about progress made by women. They gave a loud standing ovation. Trump receives cheers and standing ovations from a bipartisan group of female lawmakers wearing white as he touts the number of women in the workforce and more women serving in Congress than ever before. “You weren’t supposed to do that,” Trump said to the group. “Don’t sit yet — you're going to like this,” he added. “Exactly one century after Congress passed the Constitutional Amendment giving women the right to vote, we also have more women serving in Congress than ever before,” Trump said. (Alex Wong/Getty Images) Female lawmakers cheer during President Donald Trump's State of the Union address in the chamber of the U.S. House of Representatives on Feb. 5, 2019, in Washington. The president then highlighted his administration’s support for nationwide paid family leave, a policy his daughter Ivanka Trump worked on. He also made a fast pivot to call on Congress to pass legislation banning late-term abortion. “There could be no greater contrast to the beautiful image of a mother holding her infant child than the chilling displays our nation saw in recent days,” Trump said, specifically citing embattled Virginia Gov. Ralph Northam’s recent comments that stirred controversy. “I am asking Congress to pass legislation to prohibit the late-term abortion of children who can feel pain in the mother's womb. Let us work together to build a culture that cherishes innocent life. And let us reaffirm a fundamental truth: all children – born and unborn – are made in the holy image of God,” Trump said. Trump’s comments prompted swift backlash from some women in the audience, like 2020 candidate Sen. Kamala Harris, the Democrat from California. Trump used the speech to announce the next move forward with North Korea — a peace summit on February 27 and 28 in Vietnam. Though recent U.N. reports found North Korea’s nuclear and ballistic missile programs are still intact, despite promises of “complete denuclearization” after the last summit, held in June in Singapore, Trump promoted his message of peace with the news. “If I had not been elected President of the United States, we would right now, in my opinion, be in a major war with North Korea. Much work remains to be done, but my relationship with Kim Jong Un is a good one,” Trump said. “Chairman Kim and I will meet again on February 27 and 28 in Vietnam,” he announced. Much has changed since the president’s State of the Union address a year ago. He now faces a divided Congress — and one that has more women and people of color than ever before. Abrams was a manifestation of that change, both as a woman of color — the first African-American woman to give the State of the Union response — and as a new voice that rose out of 2018. 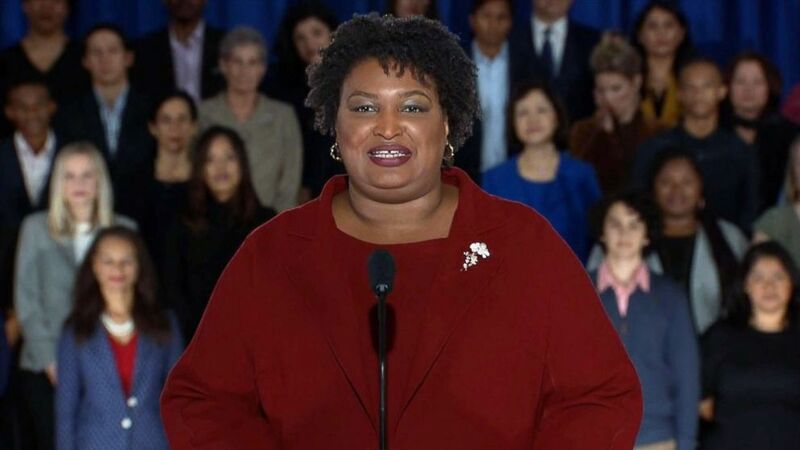 Even though she lost a tight race for Georgia governor last November, Abrams nevertheless was selected to be the face of the party in a speech seen by millions nationwide – a testament, experts have said, to the power Democrats believe Abrams holds to connect with a diverse electorate in a moment of American politics enveloped by the complexities of gender and race. (ABC News) Stacey Abrams delivers the Democratic response to President Donald Trump's State of the Union speech, Feb. 5, 2019. Abrams' words were further looked to in the aftermath of the scandal engulfing the Virginia governor — which she addressed without specifically referencing the calls for his resignation or the racist yearbook photo. "We must hold everyone from the highest offices to our own families accountable for racist words and deeds and call racism what it is — wrong," Abrams said. "We must hold everyone from the highest offices to our own families accountable for racist words and deeds and call racism what it is — wrong." Abrams was more direct about the president, who many predicted she wouldn’t directly call out. She defended Democrats against the president’s claims that the party wants “open borders,” saying “compassionate treatment at the border" is not the same thing. "President Reagan understood this. President Obama understood this. Americans understand this. And Democrats stand ready to effectively secure our ports and borders. But we must all embrace that from agriculture to healthcare to entrepreneurship, America is made stronger by the presence of immigrants - not walls," Abrams said. But Abrams emphasized a similar theme from the president about victory for the country, over one party. "So even as I am very disappointed by the President’s approach to our problems, I still don’t want him to fail. But we need him to tell the truth, and to respect his duties and the extraordinary diversity that defines America," Abrams said.